Dive into wet and wild fun with your kids this summer at one of these favorite attractions. Nothing says "family fun" in the summer like spending time together at a water park. There are lots of options for splashin' around with the fam in Middle Tennessee, whether you go to one of our local splash pads, Nashville Shores, Boro Beach at Sportscom or beyond. For weekending fun, Dollywood's Splash Country or Six Flags Over Georgia have plenty of wet to cool your kids down, so scroll down and find the perfect day or weekend away for your crew. Let's get splashy! Murfreesboro Parks and Rec operates the city's affordable water park. It features lap lanes, three water slides, a play structure with spray features and zero-depth entry, a rock wall, a splash pad area, diving boards and a floating bridge. The play structure has its own mini slide and bucket at the top that dumps tons of water down on the swimmers below. NASHVILLE SHORES 4001 Bell Road Hermitage, TN 37076 615-889-7050 Weekday general admission: $36.99 those 48 inches and taller (save $8 when you buy online) $28.99 those 47 inches and shorter Weekend general admission: $39.99 those 48 inches and taller (save $8 when you buy online) $28.99 those 47 inches and shorter More ticket info: $59.99 season pass free ages 2 and younger $9 parking fee Resting next to Percy Priest Lake, Nashville Shores has a large wave pool, lazy river, eight water slides and the Kowabunga Beach water play area for youngsters. Your family will love Big Kahuna, a family serpentine raft ride that takes off atop a 57-foot platform. Barefootin' Bay is a colorful water treehouse and sprayground play structure with more than 35 interactive water features, mini slides and a tipping bucket — it's all specially designed for pint-sized water park guests. NEW THIS YEAR: Aqua Park, a giant obstacle course over the lake. SPLASHTOWN AT SMYRNA OUTDOOR ADVENTURE CENTER 100 Sam Ridley Pkwy. East Smyrna, TN 37167 615-459-9710 $5 ages 13 & older $4 ages 1 - 12 Kids will love Smyrna's water attraction featuring slides, a splash pad, a current channel and a pool with a climbing wall. WAVE COUNTRY 2320 Two Rivers Pkwy. Nashville, TN 37214 615-855-1092 $12 adults $10 ages 3 - 12 (child admission is half price Mon - Thu from 3 - 5 p.m.; there is also a coupon online) Metro Parks operates Nashville’s affordable water park. Have a blast in the giant wave pool, experience three water flumes and zip down two speed slides. For small fries, there’s a kiddie pool with water-dropping features and a playground. 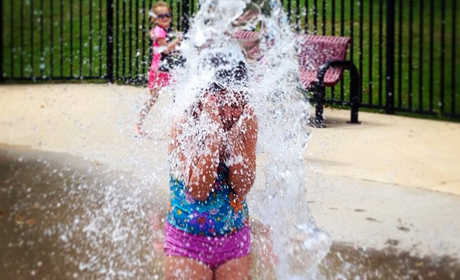 The three spraygrounds in Metro Parks are open May 27 - Sept. 4. Admission is free. CUMBERLAND PARK 592 S. First St., Nashville 615-862-8508 Mon - Sat 9 a.m. - 7 p.m., Sun 12 - 6 p.m.
KIRKPATRICK SPRAYGROUND 620 S. Ninth St., Nashville 615-862-8453 Mon - Fri 10 a.m. - 5:30 p.m., Sat - Sun 10 a.m. - 3 p.m.
WATKINS SPRAYGROUND Jo Johnston Avenue at 17th Avenue North 615-862-8469 Mon - Fri 9 .m. - 5:30 p.m., Sat - Sun 10 a.m. - 3 p.m.
Beech Bend Park’s Splash Lagoon 798 Beech Bend Road Bowling Green, KY 42101 270-781-7634 $35.99 for 54 inches and taller $31.99 for 53 inches and shorter Free ages 2 and younger Tickets include admission to the amusement park side Beech Bend’s Splash Lagoon has several aquatic attractions. The most recent features include the Cyclone Saucers water slide, Tidal Wave, Riptide and Polynesian Plunge. For little ones, Lotta Watta Island boasts an interactive splash pool with slides. Plus, there's a lazy river, wave pool and Lily Pad Challenge. Free sunscreen's available, too! DOLLYWOOD'S SPLASH COUNTRY 2700 Dollywood Parks Blvd. Pigeon Forge, TN 37863 800-365-5996 $49.95 adults $44.95 ages 4 - 11 Free ages 3 and younger (does not include theme park admission) Dolly Partons' water park boasts more than 24 adventure slides and aquatic thrill rides from low-speed, little-kid-friendly options to aggressive high-speed thrills. Splash Country features the RiverRush, Tennessee’s first and only water coaster. This exhilarating ride races through the trees four stories in the air, and it has all the things you love about land coasters — climbs, drops, twists and turns — plus lots of splashes along the way. Small children can have fun exploring The Cascades. Here, an 8,000-square-foot pool invites your family to cool off under a waterfall while also enjoying water slides, a geyser, water jets and more than 20 interactive elements. Wee ones can squeal with delight as they discover hidden misters, bubblers and slides in secret coves. The Tailspin Racer is a 360-degress looping water speedway that lets you race against friends and family. the five-story-tall attraction sends you through twists, tunnels and extreme drops. HOLIDAY WORLD'S SPLASHIN' SAFARI 452 E. Christmas Blvd. Santa Claus, IN 47579 812-937-4401 $48.99 for 54 inches and taller $38.99 for 53 inches and shorter (online discounts available; tickets include amusement park admission) Cool off in the 40-acre water park featuring loads of thrills and chills with water coasters and slides for everyone. Splashin' Safari boasts two giant water coasters — Mammoth and Wildebeest. Each have seven drops to drench you. There’s a lazy river, wave pool and lots of small water slides for your littlest ones. Free sunscreen's available, too! NEW THIS YEAR: Tembo Falls, an elephant-themed water slide complex with eight junior slides including twisters, a helix, a mini-bowl and two racing slides. In addition, there's the Tembo Tides, a junior wave pool plus spray features for younger children. SIX FLAGS OVER GEORGIA'S HURRICANE HARBOR 275 Riverside Pkwy., SW Austell, GA 30168 $69.99 for 49 inches and taller (discounts available online!) $49.99 for 48 inches and shorter Free ages 2 and younger Tickets include admission to main theme park This multi-million dollar water park inside Six Flags features a giant wave pool; an enclosed tunnel zero-gravity wave slide on Tsunami Surge; three twisting, turning water slides on Bonzai Pipelines; and a giant interactive children's area. LAKE WINNIE'S SOAK YA WATER PARK 1730 Lakeview Drive, Rossville, GA 30741 706-866-5681 $34.95 ages 3 and older $17.95 ages 1 - 2 This water park outside of Chattanooga is included with Lake Winnie admission and features a water obstacle course, Coke Float Cove; Crazy River with rolling waves and water geysers; Soak-N-Slide children's play area featuring four water slides, a zero-depth entry activity pool and many elements featuring spraying water; Splish-N-Splash body slides; Twist-N-Shout tube slides; Water Works play structure featuring a water slide, dumping bucket and more; and the Zoom Flume tube ride.